How to read RSS news without RSS reader installed? RSS is the abbreviation of Really Simple Syndication, which is kind of summary of rich website. It uses family of standard web feed formats to publish frequently updated information: blog entries, news headlines, audio, video. Now it is widely used in online new channels, blog and wiki. Using RSS news can help you get the latest news in a easiest and quickest way. However, now most of the RSS new is saved in XML file formats, if you do not have RSS news reader installed, you can not read them smoothly, let alone reading news on cellphone, iPad or other small device. In this article, I will share a method of reading RSS news without RSS reader installed, meanwhile you can also read RSS news in your small devices or applications. 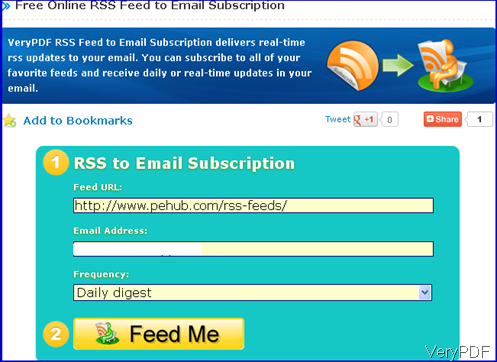 VeryPDF newly published a free online cloud based application named Free Online RSS Feed to Email Subscription, by which you can create full-text feed from shortened RSS feed and read latest news automatically. This free online application can help you convert HTML or XML based RSS news to text based article and then send it to your email box according to your time you specified. Please check more information of this software on its homepage, in the following part, let us check how to use this software. The following snapshot is from the website this application, please have a check. This application is quite easy to use. This software is totally free, you do not need to spend any fee then you can read RSS news without installing RSS reader and other devices. Step 2. Read RSS news in email box without RSS reader installed. After clicking button Feed Me then you will see the following snapshot. As this software allows you to read unlimited number of source feed URLs, here you need to choose which part do you really need or all. Please click button Subscribe after the link. After choosing, in your email box, there will be a confirmation letter. Please click it and then you can finish ordering RSS news online. In the future days, you can read RSS news daily or timely in your email box even if you do not have RSS reader installed as this software have converted RSS feed to text based information. By this free online application, you can read RSS news without RSS reader installed. During the using, if you have any question, please contact us as soon as possible. How to rotate the page when converting HTML to PNM? How to print FPX to PDF file? Can I use your PDF to PowerPoint Converter to break the password in a pdf file? How to convert Office to flash by online application? How to compress PDF without platform limitation? This entry was posted in VeryPDF Cloud API and tagged read RSS. Bookmark the permalink.